Insights of a Godly Warrior Subtitle: What Appears Bad is Good. 1 Insights of a Godly Warrior Subtitle: What Appears Bad is Good. 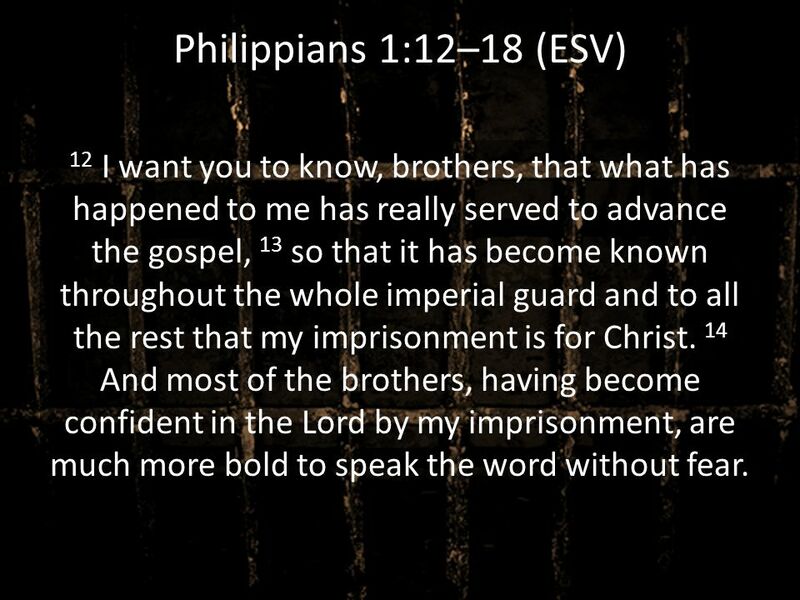 3 Philippians 1:12–18 (ESV) 12 I want you to know, brothers, that what has happened to me has really served to advance the gospel, 13 so that it has become known throughout the whole imperial guard and to all the rest that my imprisonment is for Christ. 14 And most of the brothers, having become confident in the Lord by my imprisonment, are much more bold to speak the word without fear. 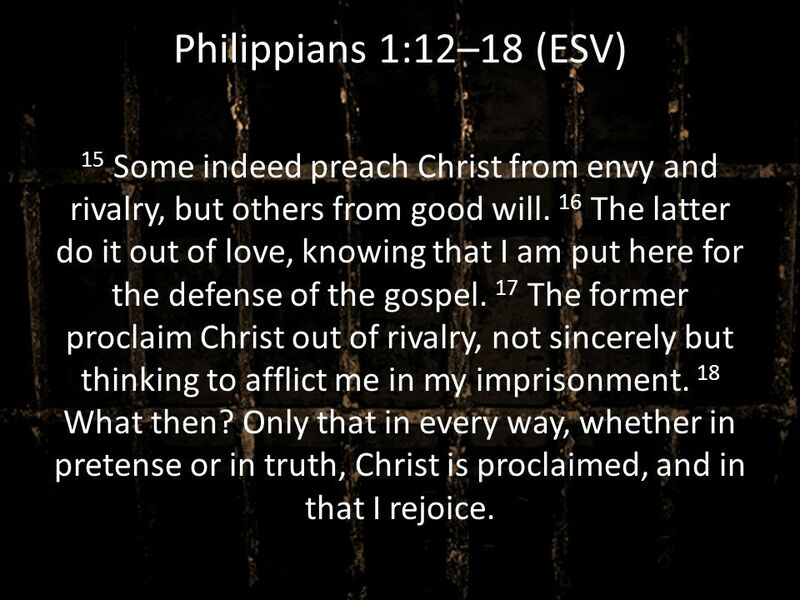 4 Philippians 1:12–18 (ESV) 15 Some indeed preach Christ from envy and rivalry, but others from good will. 16 The latter do it out of love, knowing that I am put here for the defense of the gospel. 17 The former proclaim Christ out of rivalry, not sincerely but thinking to afflict me in my imprisonment. 18 What then? Only that in every way, whether in pretense or in truth, Christ is proclaimed, and in that I rejoice. 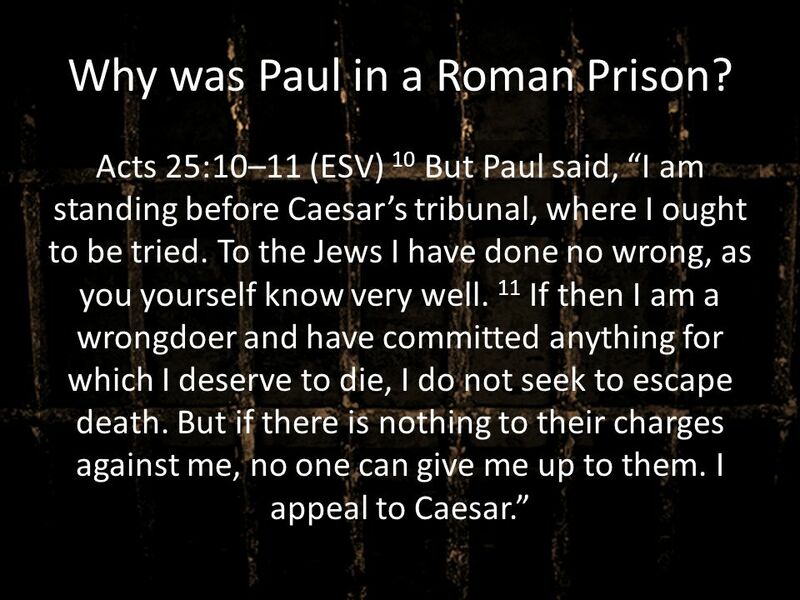 5 Why was Paul in a Roman Prison? 12 I want you to know, brothers, that what has happened to me has really served to advance the gospel The Philippians grieved over Paul’s imprisonment. Would this hinder the gospel? How could God allow it? The warrior sees advancement. 13 so that it has become known throughout the whole imperial guard The Good news reaches those whom it otherwise wouldn’t. 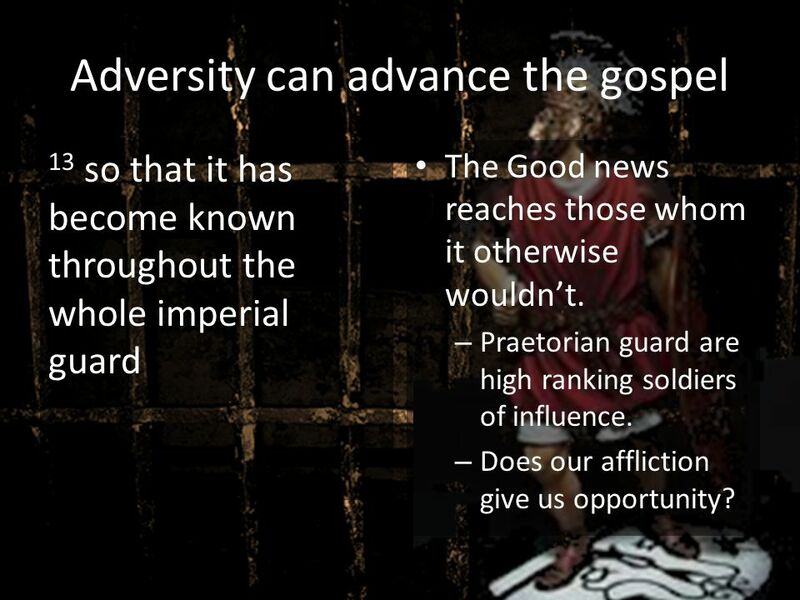 Praetorian guard are high ranking soldiers of influence. Does our affliction give us opportunity? and to all the rest that my imprisonment is for Christ. 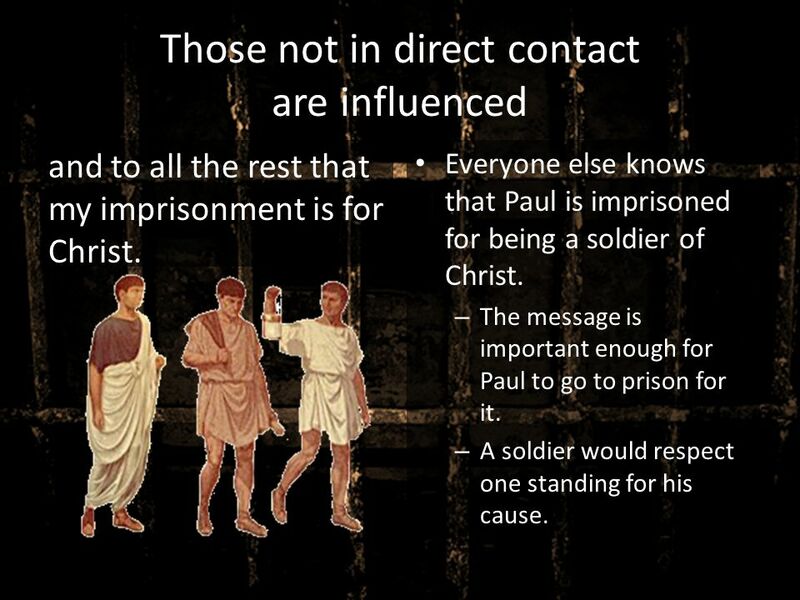 Everyone else knows that Paul is imprisoned for being a soldier of Christ. 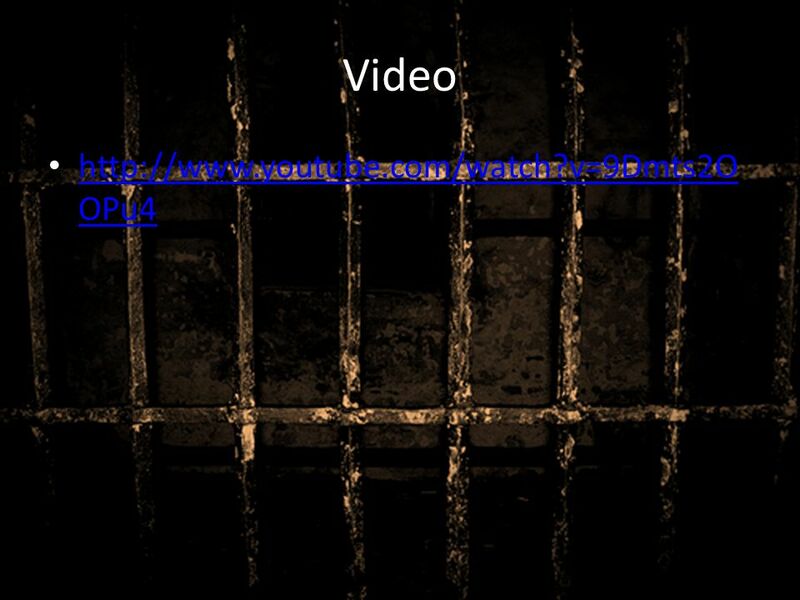 The message is important enough for Paul to go to prison for it. A soldier would respect one standing for his cause. 10 What’s the motive? 15 Some indeed preach Christ from envy and rivalry, but others from good will. 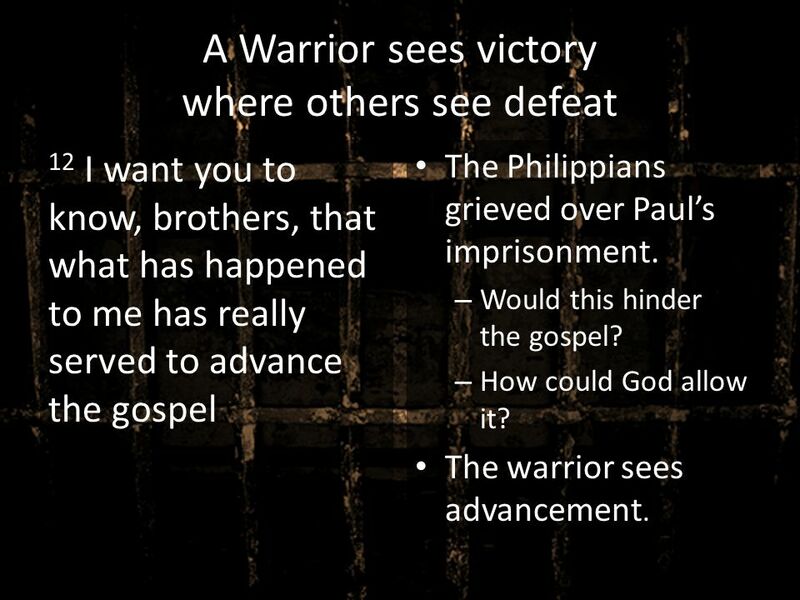 Some see the Warriors imprisonment as an opportunity. 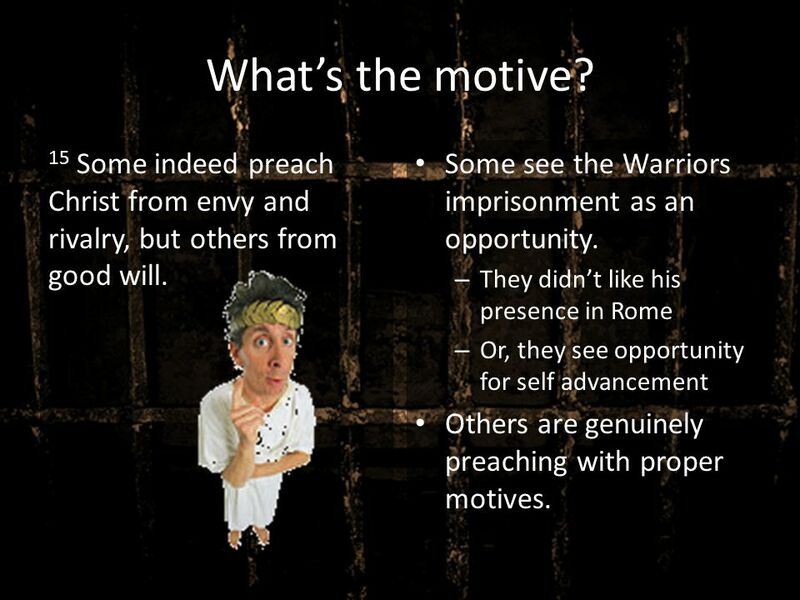 They didn’t like his presence in Rome Or, they see opportunity for self advancement Others are genuinely preaching with proper motives. 16 The latter do it out of love, knowing that I am put here for the defense of the gospel. 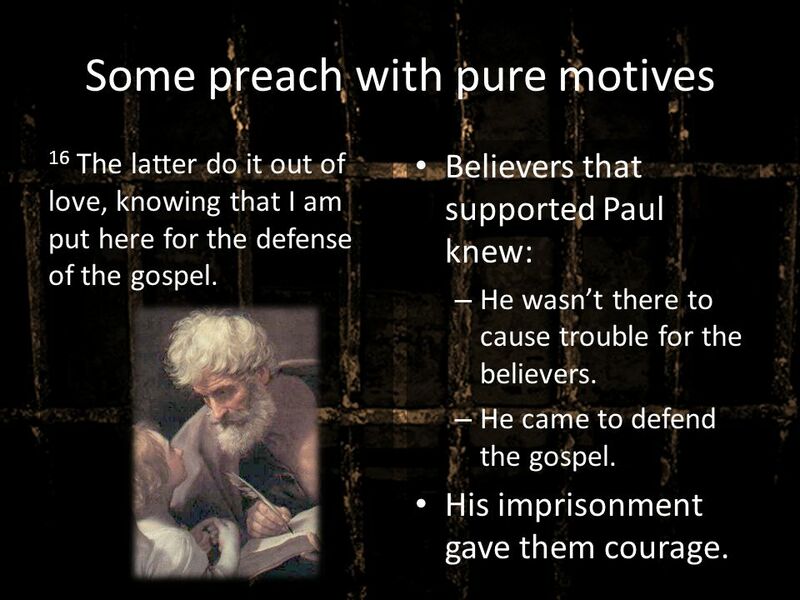 Believers that supported Paul knew: He wasn’t there to cause trouble for the believers. He came to defend the gospel. His imprisonment gave them courage. 17 The former proclaim Christ out of rivalry, not sincerely but thinking to afflict me in my imprisonment. 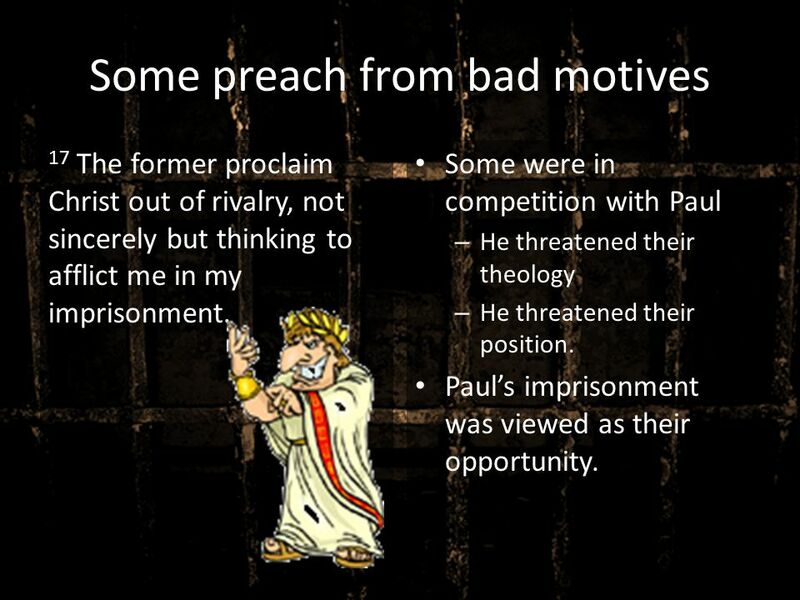 Some were in competition with Paul He threatened their theology He threatened their position. 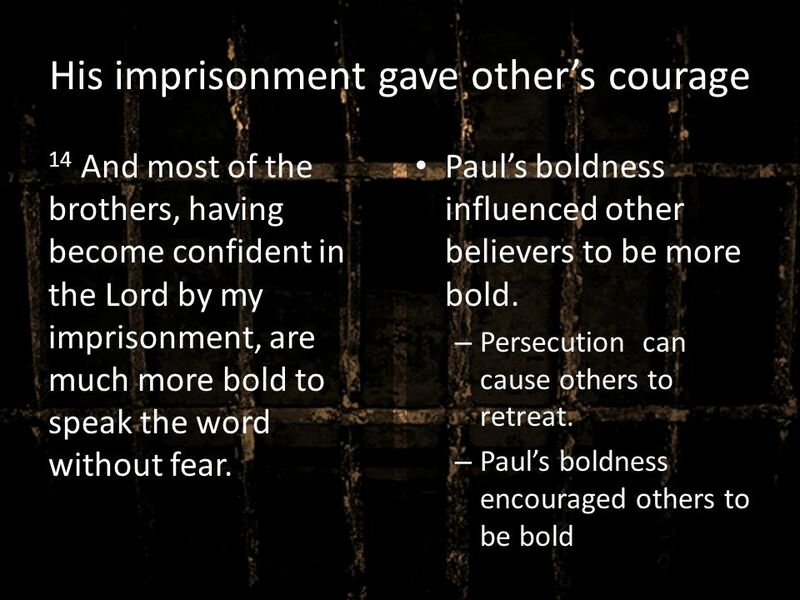 Paul’s imprisonment was viewed as their opportunity. 13 Paul’s Attitude? 18 What then? 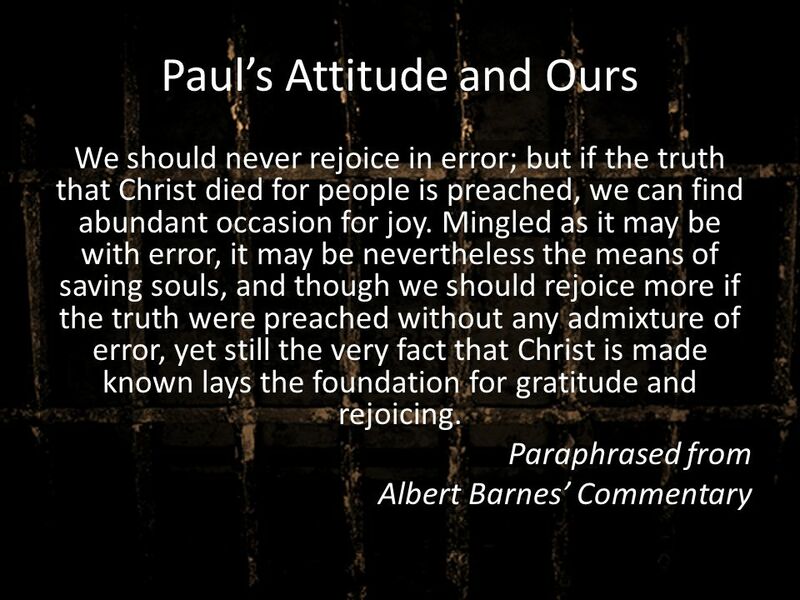 Only that in every way, whether in pretense or in truth, Christ is proclaimed, and in that I rejoice. Does it matter? 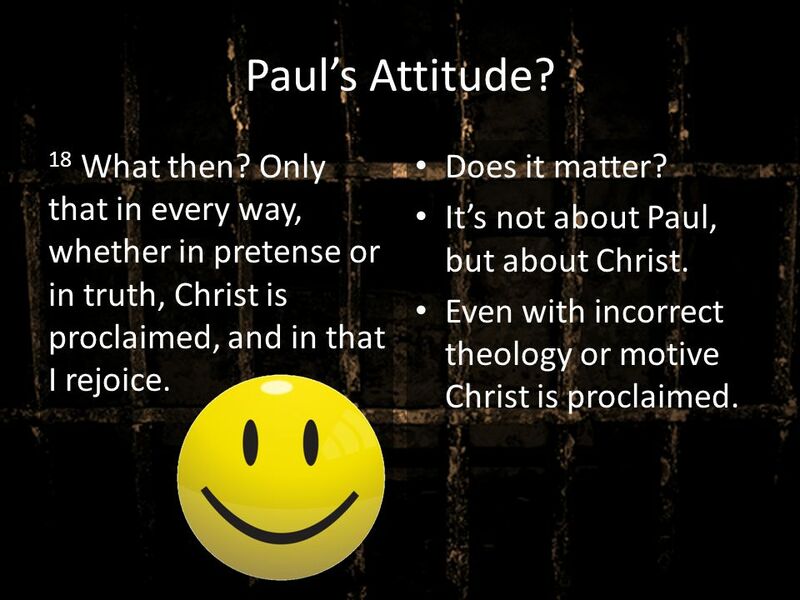 It’s not about Paul, but about Christ. Even with incorrect theology or motive Christ is proclaimed. 14 What about my attitude? When I’m laid aside by sickness, I’ll rejoice that others are in health, and are able to make the Savior known. 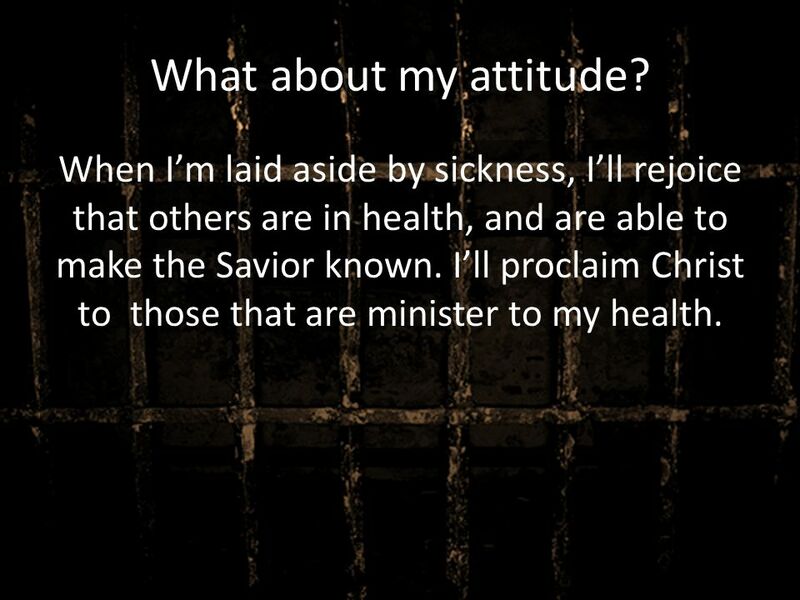 I’ll proclaim Christ to those that are minister to my health. 15 What about my attitude? 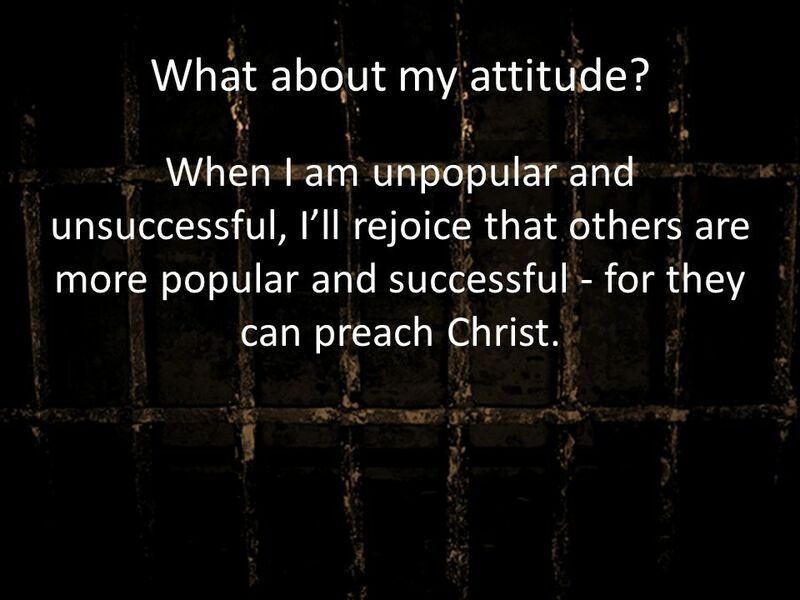 When I am unpopular and unsuccessful, I’ll rejoice that others are more popular and successful - for they can preach Christ. 16 What about my attitude? 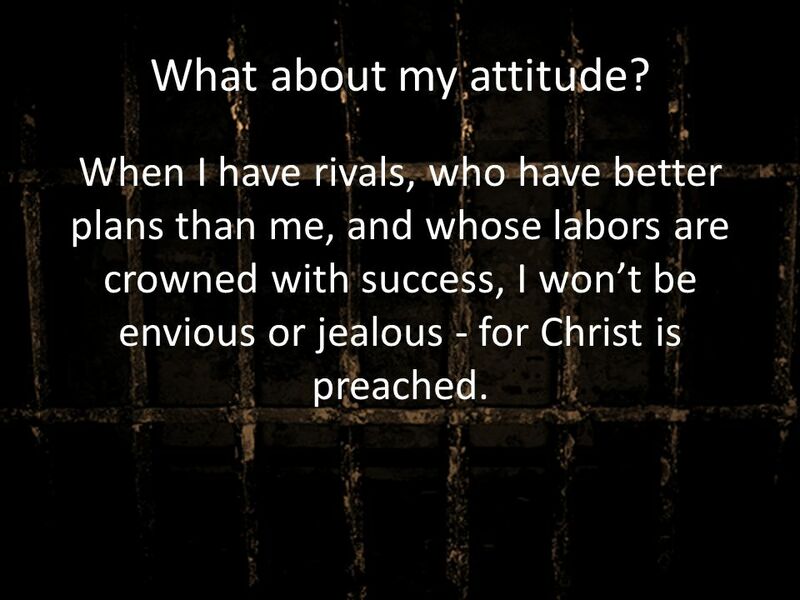 When I have rivals, who have better plans than me, and whose labors are crowned with success, I won’t be envious or jealous - for Christ is preached. 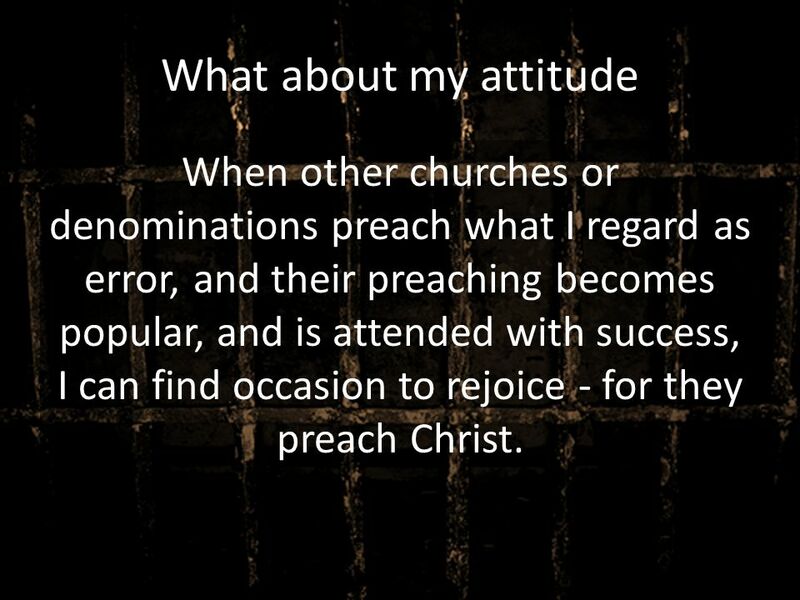 17 What about my attitude When other churches or denominations preach what I regard as error, and their preaching becomes popular, and is attended with success, I can find occasion to rejoice - for they preach Christ. 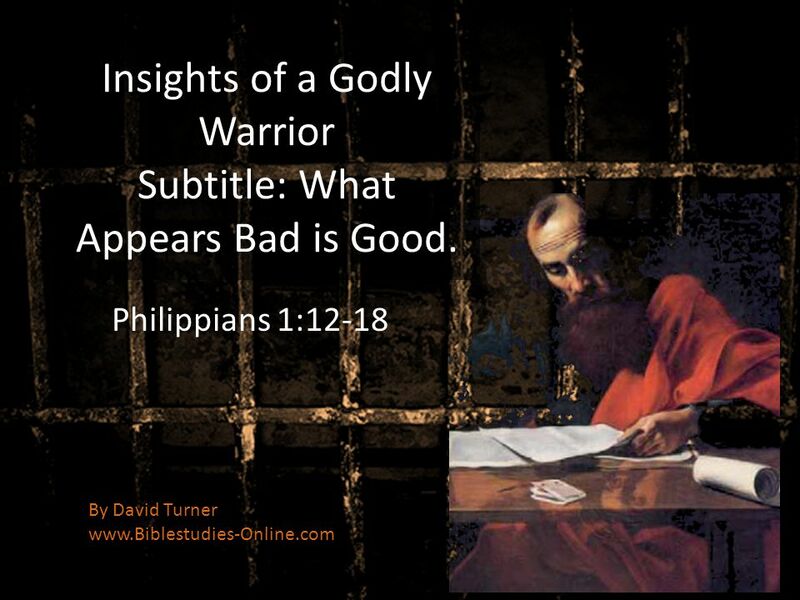 Download ppt "Insights of a Godly Warrior Subtitle: What Appears Bad is Good." FREE AT LAST Philippians 1: Philip. 1:12-24 (New Living Translation) And I want you to know, dear brothers and sisters, that everything that has. Be Joyful! Philippians 1: VICTOR FRANKL Everything can be taken from men but one thing: the last of human freedoms - the ability to choose one's. People Will NOT Follow Dead, Dull, Disillusioned, Frustrated, Daggum Crybabies How to Be a Joy to Those Around You in ALL Situations. Being Happy No Matter What Being Happy No Matter What. Facing the Giants: Serious Setbacks Part 1 Series: Philippians- Gateway to Joy Facing the Giants: Serious Setbacks Part 1 Series: Philippians- Gateway. 1 Philippians Class Schedule. 2 Philippians1:18-20 Christ is Proclaimed 18 What then? Only that in every way, whether in pretense or in truth, Christ. Ambassador for God Be Relational, Be Missional Series: 1 of 6 Zechariah 6:9-15 Philippians 1:12-16. Proper Perspective (Philippians‘). 12 Now I want you to know, brothers and sisters, that what has happened to me has actually served to advance the.